Enhance your critical thinking skills in a clinical setting and prepare for the NCLEX-PN exam with this clear, easy-to-understand, and highly visual book. Written by two experts and current educators in pediatric and maternity nursing, the 4th edition has been updated to reflect today’s best practices and evidence-based care. Each chapter includes a built-in workbook, integrated case studies, and in-patient scenarios to sharpen your understanding of the content. 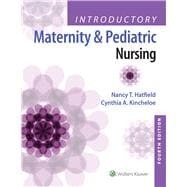 Plus, this edition is accompanied by a robust array of interactive online resources to enrich your learning experience and further prepare you for maternity and pediatric nursing practice. NEW & UPDATEDCONTENT, including the latest NANDA terminology, American College of Obstetricians and Gynecologists (ACOG) guidelines, the Baby Friendly Initiative, medication updates, and more, prepare you for practice in today’s rapidly changing healthcare environment. UNIQUE! A built-in workbook at the end of each chapter includes NCLEX-PN-style review questions, study activities, and critical thinking "What Would You Do?" exercises. NEW! Concept Mastery Alerts highlight commonly misunderstood concepts and provide helpful explanations to clarify them. Chapter-opening case studies foster critical thinking. A Nursing Process approach prepares you to write individual care plans by walking you through each step of the nurse’s role in data collection (assessment), relevant nursing diagnosis, outcome identification, planning, implementation, and evaluation. First-person narratives help you understand the feelings of clients and their family members. Cultural Snapshots encourage you to think about cultural differences when caring for your clients. Learning Objectives and Key Points, which set goals for understanding and highlight must-know information, help you master important concepts. Test Yourself questions allow you to check your understanding as you go. Clinical Secrets highlight safety concerns and other important topics to prepare you for on-the-job challenges. ENHANCED online student resources include NCLEX-PN-style questions (revised to reflect the latest test plan) including new alternate format questions), drug monographs, maternity and pediatric nursing videos, audio glossaries, dosage calculation quizzes, and more. Comprehensive instructor resources include guided lecture notes, PowerPoint presentations, test generator, image bank, QSEN competencies, concept-based curriculum maps, quizzes, assignments, and more. This leading content is also incorporated into Lippincott CoursePoint, a dynamic learning solution that integrates this book’s curriculum, adaptive learning tools, real-time data reporting, and the latest evidence-based practice content together into one powerful student education solution. Lippincott CoursePoint improves the nursing students’ critical thinking and clinical reasoning skills to prepare them for practice. Learn more at NursingEducationSuccess.com/CoursePoint.